A white marble tablet with set onto a pink marble backboard. The tablet is topped with a triangular head with tapered borders at the top and bottom. The dedication is written in incised lettering in the centre of the tablet and flanked with two incised columns on either side. 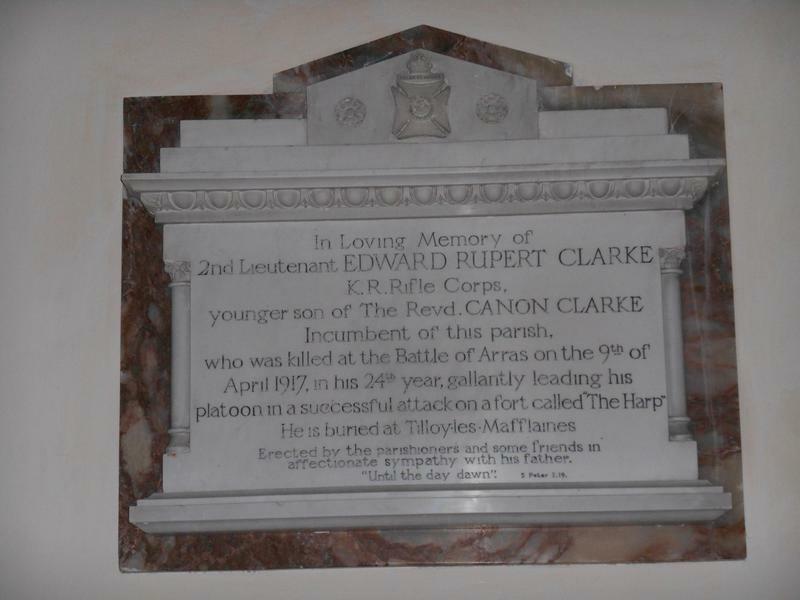 In Loving Memory of / 2nd Lieutenant EDWARD RUPERT CLARKE / K.R. 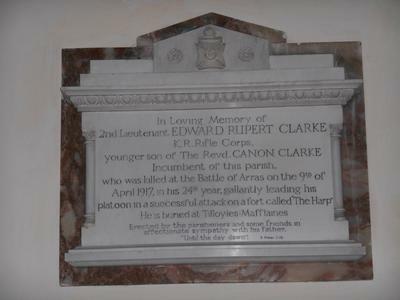 Rifle Corps, / younger son of the Revd. CANON CLARKE / Incumbent of this parish. / who was killed at the Battle of Arras on the 9th of / April 1917, in his 24th year, gallantly leading his / platoon in a successful attack on a fort called ‘The Harp’ / He is buried at Tilloy-les Mafflaines / Erected by the parishioners and some friends in / affectionate sympathy with his father / “Until the day dawn” 2 Peter 1.19. Information shown: Rank, forename, surname, regiment, place of death, date of death, age of death.